Special Containment Procedures: SCP-3719 is kept in a standard object containment stall in the Anomalous Objects Wing of Site-82. Foundation web crawler SE851G ("AZURE CHAWLA") is to track social media posts, news reports, telephone calls, and SMS messages disseminated in the state of Maryland for references to SCP-3719-Cobalt events. References made to unnatural flowering plant growth patterns, the formation of collective human masses, and irregularities in the operation of yard equipment are to be flagged and isolated for further monitoring. This is done to mitigate or prevent future SCP-3719-Cobalt events from occurring. SCP-3719-A-1 through -61 (which have been collectively designated SCP-3719-B) are contained in suspended animation in a standardized 10,000 L Class 6 Lovell-Huron containment vat.1 Any persons associated with the discovery of SCP-3719, including nearby genetic relatives of any SCP-3719-A instances within SCP-3719-B, are to remain unaware of the containment of these instances. Persons associated with this anomaly have been administered Class-A amnestics. These persons are to undergo a false memory implantation procedure to subdue any memory of instances SCP-3719-A-1 through -61 and the impact they made on the Middlesex suburb during their life. Despite being manufactured for gas-powered mowing operation, SCP-3719 relies on the energy exerted by its user (designated SCP-3719-A) to operate its engine. In an attempt to prevent fatigue and over-exertion in SCP-3719-A, SCP-3719 will reclaim and consume any grass passing through its cutting deck with high efficiency to produce additional energy. 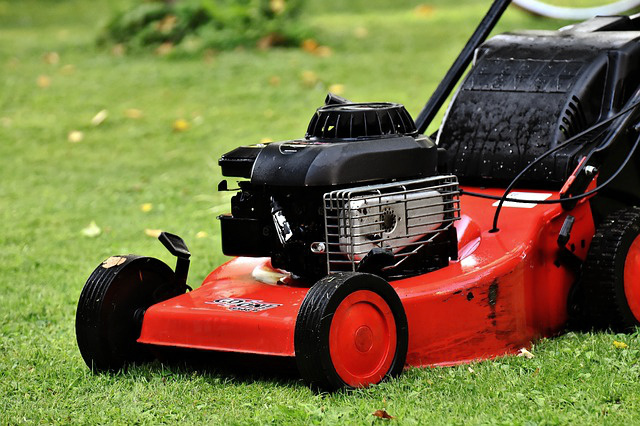 Energy produced does not mitigate the force required to push SCP-3719, but rather, is directly transferred into SCP-3719-A through the lawn mower handle by esoteric means. Any excess grass is stored in a chamber within SCP-3719 for future consumption. SCP-3719 was discovered in the Middlesex suburb of Baltimore, Maryland on August 17, 2014. Upon discovery, SCP-3719 was being used by numerous residents serving as SCP-3719-A simultaneously. 61 residents in total were integrated into a collective mass4 which was piloting SCP-3719 along the road with apparent ease despite its size. 6 km of roads in the area had anomalously manifested grass5 while approximately 2 km of roads had already been mowed by the time Foundation personnel were alerted to the anomaly. The formation of masses similar to SCP-3719-B, as well as the widespread manifestation of grass on public roads, has been designated an SCP-3719-Cobalt event. How the prolonged use of SCP-3719 leads to the manifestation of these events is currently under active investigation. Addendum 3719.1: The following is a transcript of an interview with Grace Farley (PoI-3719-7), the mother of Kevin Farley. Kevin Farley was determined to be an individual within SCP-3719-B at the time of discovery. Note: Agent Frank Digby began the interview shortly after Foundation personnel arrived on scene following the discovery of SCP-3719-B. A 3 km in diameter no-go zone around the neighbourhood was observed, at which point the neighbourhood was cordoned off. Any individuals directly outside the confines of the no-go zone were administered Class-A amnestics. The interview began after Foundation personnel searched for individuals directly affected by the SCP-3719-Cobalt event. Mrs. Grace Farley (designated PoI 3719-7) was the seventh person selected for interview purposes. Agent Frank Digby approached Mrs. Grace Farley under the guise of a concerned neighbour associated with the neighbourhood watch. Researcher Frank Digby: Hello Mrs. Farley. I'm Frank Digby, from just down the road. Do you mind if I ask you a few things about the, ahm, incident? Mrs. Grace Farley: Of course, Frank, anything you need, my dear. And please, call me Grace. Agent Digby: Right. So, Grace, how did you first hear about the lawn mower? Mrs. Farley: Old Billy kept that mower locked up in his garage since before my boys were born. That Billy's always been on the go, but after his accident, it's been hard for him to maintain things. Robbie lifted the mower from him in the Spring, had it refurbished, made sure it worked fine. Let me tell you, Frank, there was just somethin' about that mower that made it special. In all my days, I've never seen Robbie so interested in anything, 'cept for that mower. Agent Digby: Interested? In what way? Mrs. Farley: The sparkle in his eyes when he worked on that thing, you wouldn't believe. It had to be special. Wouldn't make sense otherwise. Agent Digby: So Bill owned the mower and he gave it to Robert. Is there any indication that anyone else used the mower during that time? Mrs. Farley: Robbie went about, almost door-to-door, askin' around to see if anyone wanted their lawns cut, free of charge. That kid was happy to do it, and it seemed like once he started, he just couldn't stop himself. On the first day, he cut nine different lawns! Can you believe that, Frank? Mrs. Farley: Mhm. The next week it was like everybody was asking Rob to cut their lawns, all the way down to Waterview, and boy did he do it. Robbie's one of those meek types, even letting the little ones try the mower so they could learn too. I would never allow my youngest to go near the thing, but those kids pushed it like it was a toy. Agent Digby: Your oldest son is Kevin, correct? Mrs. Farley: Yes, my dear. Agent Digby: Grace, why did Kevin start using the mower? Mrs. Farley: I had to let my boy try it. Just had to. Heaven knows I wouldn't even know how to use the thing myself, but my Kevin, he's a smart cookie, he is. Could figure out just about anything he put his mind to. So when he joined the others I just knew they were going to enjoy themselves just fine. It's better off to have 'em so close together, Frank, isn't it? Agent Digby: I'm not exactly sure what you mean, Grace. Mrs. Farley: Kevin's a — [Pause.] A smart kid with a good heart. That's the boy I raised. Yeah, I always wanted to keep him away from the bad crowd. Couldn't bear to lose my baby. So I tried hard, see? To teach 'em right. To get him along with the other smart boys I know are out there too. Now, Frank, to see him wanna join the other kids, that made me proud. [Pause.] All those kids, together, closer than a hug. That's what gives this community its spirit. We can all learn to become as warm as those kids were, and that mower's the source of it all. Agent Digby: How did Kevin and the other kids come together? Mrs. Farley: There were probably 7 of them, or so. The closest boys an' girls in the neighbourhood. We're all good parents. We all know how to raise a good kid. Raise a kid well and eventually, they'll raise themselves. Agent Digby: Grace, do you believe that lawn mower is going to help them learn how to raise themselves properly? Mrs. Farley: I don't just think so, Frank, I've seen it with my own eyes. Those kids could achieve incredible things if they just worked together. All 7 of 'em, in the same body, that's what we raised them for. Agent Digby: You're saying these kids were in the same body? But that's just not possible, Grace. What you're saying isn't possible. Mrs. Farley: [Pause.] Makes sense to me, Frank. Wouldn't you like to see all our sons and daughters together, bonding deeper than they ever could naturally? Having them so close together, boy, it just gives me the fuzziest feelin'. Middlesex ain't what it was when I grew up. I never learned the same closeness my sons know. Mrs. Farley: Being able to help the Other in such a capacity, with the smartest sons and daughters this neighbourhood's ever seen. That's human. That's heart. I just crave to bask in the skin of the Other. To be as warm as them. Wouldn't you like to be as warm as those kids, Frank? Wouldn't you like to share my skin too? Mrs. Farley: Why can't you share one body, one soul, and by God if it's possible, one flesh? We're all human, Frank. We're one. We were born together and shall remain together. It's meant to be that way, 'cause what other way could there be? Keep 'em together and we won't be having any more tragedies, like the ones you see in the headlines every week. That mower is the best thing to happen to this neighbourhood, period. You wouldn't understand unless you stitch your heart where all others can see and bask in the skin of your fellow man. 1. Which is used to keep sensitive anomalous entities in immediate and indefinite cryonic storage. See T. Lovell's Cryonics and You (or How I Became a Teenage Ice Pop), published in 2011. 2. This includes close familial relatives within one to two generations of SCP-3719-A. 3. This area of effects expands directly proportional to the number of SCP-3719-A operating SCP-3719 at a time. 4. Weighing approximately 5,000 kg. 5. Which was spreading at a speed of 2 meters per hour.